Oh no! Your little one has a cavity! What’s a parent to do!? First, don’t panic. Second, don’t blame yourself. It’s hard enough to get adults to brush and floss adequately. And even if your little one has stellar oral hygiene, genes may play a role in their susceptibility to tooth decay. No doubt your child’s dentist advocated to take care of the cavity before it gets worse. And perhaps you’re wondering — why? Aren’t those baby teeth going to fall out anyway? Why put your child through the discomfort of a dental procedure? Well, yes, those teeth will fall out someday. But as long as that tooth is still in place, it’s very important to preserve it. For starters, not treating a cavity means tooth decay will get worse. For your little one, this can be quite painful. Untreated cavities get bigger as bacteria do their work. Teeth may crack. Eventually, decay will extend to the root and affect the nerve. This is extremely painful. Your next question might be, “Can’t we just pull the tooth?” If the damage is that extreme, your dentist might suggest this. However, if a filling can preserve the natural tooth, then this is your best bet! The main purpose of baby teeth is to maintain the space where adult teeth will come later on. The void produced by an empty tooth socket (if it’s too early) will mean there is nothing to prevent teeth from moving forward. This sets up all sorts of later complications that can, of course, lead to a need for braces, increased cavities due to overcrowding, and crooked teeth or a misaligned bite. Your child’s early teeth set up their entire mouth for its later look and feel. Not to mention, having a set of healthy teeth allows your child to chew their food and eat properly! Technology these days is much different than when you were a kid. Most dental procedures are over in a flash, and without much pain. 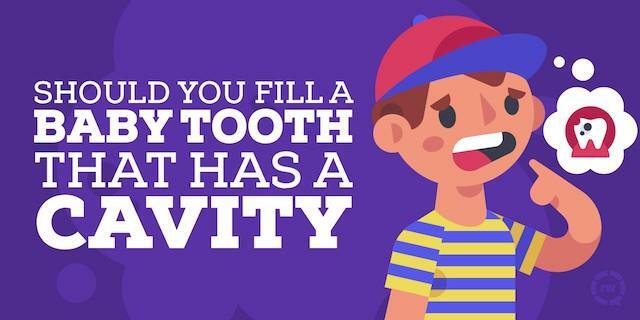 Get those cavities filled as soon as you can so that your little guy can get on with his childhood. And then make sure to keep up on that daily brushing and flossing routine. You got this!